This is my second piece for the CVC Summer Sizzler challenge and again I have gone with ‘hot 'colours and a warm summer theme. Bees humming in the garden collecting the pollen couldn't be any more summery to me. I started my tag background today with picked raspberry, salty ocean, spun sugar and picket fence distress inks with mustard seed distress stain. I spritzed the paints and dipped the tag until I was happy with the blend of colours, heat dried it and added some of the same colour distress inks to it. The stamps are Invoke Bees set. Using a honeycomb mask I sprayed Dylusions squeezed orange, but it didn't show up very well, so I stamped the bee hive and bees in black archival and then run the tag through the Tim Holtz honeycomb embossing folder with the oval diffuser over the top. This left the central part flat and I blended ripe persimmon distress ink over the raised areas to create the texture I wanted. 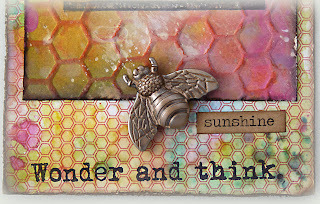 The extended part of the tag has been cut from a Papermania pad with the honey comb pattern and I dipped it in picked raspberry, wild honey, broken china, mustard seed, and peeled paint distress stains. 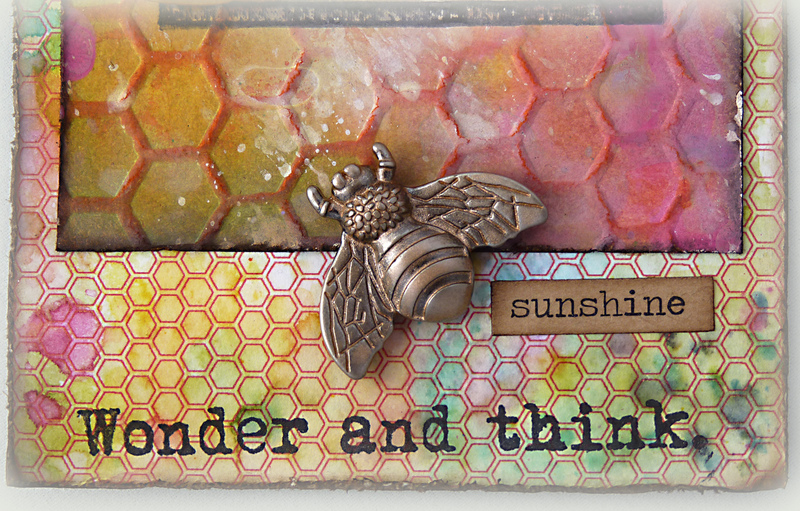 The sentiments are from the Artistic Outpost' ‘Think and Wonder’ and ‘Paperboy’ sets. 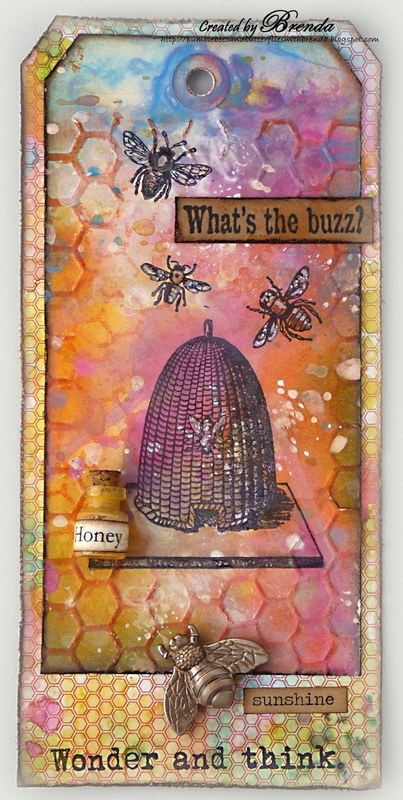 I finished off with a ‘jar of honey’, metal bee and some chit-chat words from Tim Holtz. I hope you are enjoying July. Oh wow, this is stunning!! 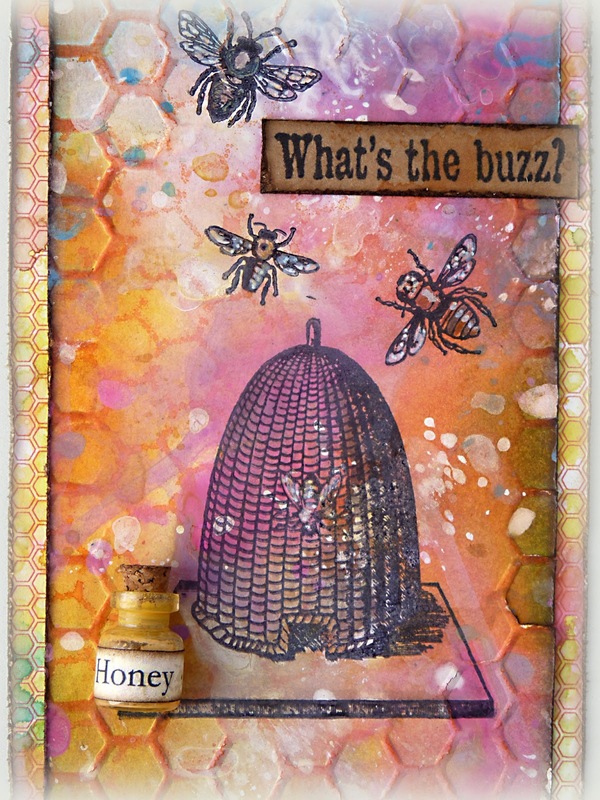 Love how the colours in the background have turned out and those bees with the beehive against the honey comb texture look stunning! certainly loving the colours.....great tag. Oh it's pure Summer!! You got a wonderful colours , even blending so many products on it. The little honey bottle it's genius! Absolutely gorgeous and brilliant bee tag. What a great tag - LOVING those colours and the diffuser? I'm not familiar with this but might have to research! Ein tolles Tag mit einem wunderschönen Hintergrund. Die Waben sind so herrlich als Umrandung. Ich bin sowas von begeistert von Deinem wunderschönen Bienen- Tag mit den vielen tollen Details. Fantastisch gemacht! Love this too. The sentiment at the bottom of the card made me giggle - I dont know why - it just put a smile on my face that wasnt there for the whole day - until I saw it. Thanks a bunch for leaving such a wonderful comment on my rusting technique post. It was super cool to read and it made me feel good about what I try to share. I love bees, an uncle of mine was a bee keeper and he let me take care of them from time to time. Love the smell and the sound =). Your tag is beautiful and the colors are gorgeous. They realy give a summery feeling. A wonderful tag, great colors and texture. Love the added jar of honey. Vibrant, summery tag, Brenda--that texture adds just the right bit of dimension, a real attention-grabber! Thank you for stopping by, my bloggy friend, I always enjoy your visits!! BEEutiful! I love the hive and all the bees!The embossing and all the FUN colors in the background are amazing! Just gorgeous Brenda, that is all I can say. Fabulous!! Super summer colours. Looks the same colour as I do having spent too much time outside at the moment lol. Just beautiful - I love the opaque chalky look to the colours, and the embossed honeycomb looks fabulous. Love those bees too! Love this beauty! Such a dreamy feel to your summertime tag! Very clever use of the diffuser and perfect placement of the beehive! Love this, love this! Enjoy your summer day! Hugs! It is hot and humid - still! An OUTSTANDING tag....WOW, WOW, WOW! lOVE the gorgeous colors and texture! Totally gorgeous! Love the embossing and all the great details! Hi Brenda...gee you have been busy! The first impression I have when I look at this tag is the effect of dripping honey! Wonderful!!! Cutest jar of honey, ever! Love this tag with the gorgeous blended colors, and thanks for the reminder to pull out those diffusers. Gorgeous!!! I love it too!!!!! !